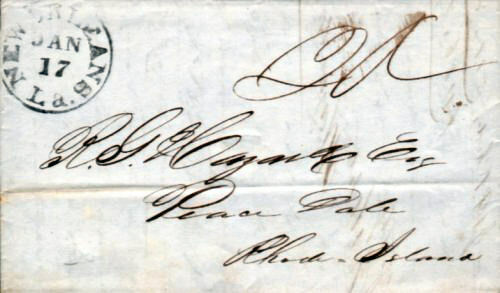 The 3 page letter is from Wagard and Green - New Orleans Cotton Merchants to R. G. Hazard (Roland) of Peace Dale, Rhode island. The letter discusses a future shipment of 3000 bales of cotton to Roland Hazard's Carolina Mills in Richmond, Rhode Island. There appears to be a problem of ready funds on the part of Wagard and Green and they have advised Mr. Hazard of a slight delay in the shipment of the aforesaid cotton. Carolina Mills was a cotton textile mill built on the Pawcatuck River in the township of Richmond, RI in 1841 by Roland G. Hazard. The mill originally ran about 100 looms. In September 1863 the Peace Dale Manufacturing Company purchased the property and sold it again in December 1863 to Theophilus Hyde. who in turn lost the mortgage back to R. G. Hazard. Hazard then deeded the property to Tinkham, Metcalf & Co. on February 1, 1869. In 1872 The Carolina Mills Company purchased the mill and began manufacturing fancy cassimeres. Some time after that the mill property was returned to ownership by the Hazard family. The Carolina Mills continued to manufacture textiles until 1930. Today the mill buildings are vacant, fire damaged and severely deteriorated. As of 1978 some of the old machinery still survived in the building. Most of the water power system was still in existence as of 1978. There was a collapsed machine ship, located near the highway, containing what may be the earliest known example of a Daniel's Planer. A 20th century wood structure still contained small jack spoolers built by the Cleveland Machine Works in 1888. The site also has dye vats, finishing machinery, assorted textile machinery, machine tools, and two vertical turbines; one was built by Rodney Hunt and the other is a Leffel with wicket gates. There is a stone building located over the surviving headrace which is likely the original mill. It appears to have been powered by a breast wheel. The large tailrace opening; a three centered stone arch was still intact as of 1978. The dam, head-gates and waste-way continue to survive as does the well-preserved mill village of Carolina, which is listed on the National Register of Historic Places. The owner of the mill property in 1978 was Paul M. Broomfield. I do not know who the current owner is.